On day 2 of our exploration of the Sangre de Cristos, we made the journey from Westcliffe, CO to the Great Sand Dunes National Park. As the crow flies, the journey is a brief cross over the narrow portion of the range. However, no easily passable road exists to get to the East entrance of the park and a bit of travel around the southern tip of the range is required. For those that have a jeep or modified high clearance 4WD vehicle, check conditions for the Medano Pass Primitive road. 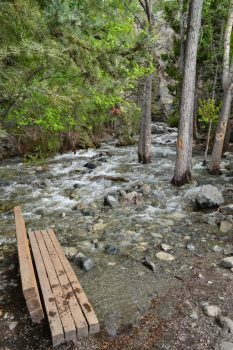 While it won’t save much time due to the extreme nature of the road (9 creek crossings), it will make for a memorable, exciting trip. 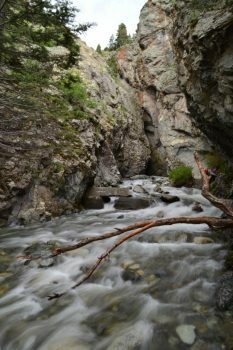 The day of our trip, June 7th, the road was only open to the fourth creek crossing due to the high level of water from the rapid winter melt. Check conditions here before planning your visit. After about 90 miles and a 12 mile jaunt on a dirt road to shorten the journey, we finally saw our first glimpses of the tallest dunes in North America. 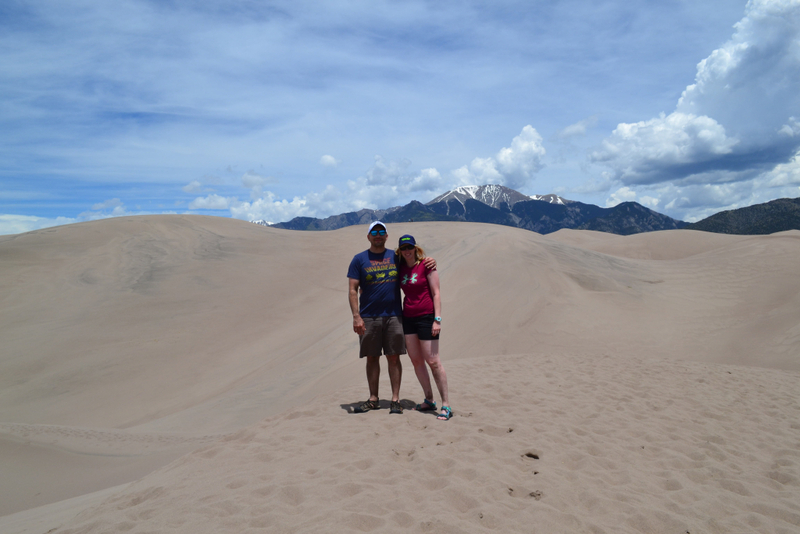 The contrast of the snow-covered mountain peaks against the smooth yellow piles of sand was incredible and strange. We had landed on the centerpiece of an extremely diverse landscape. 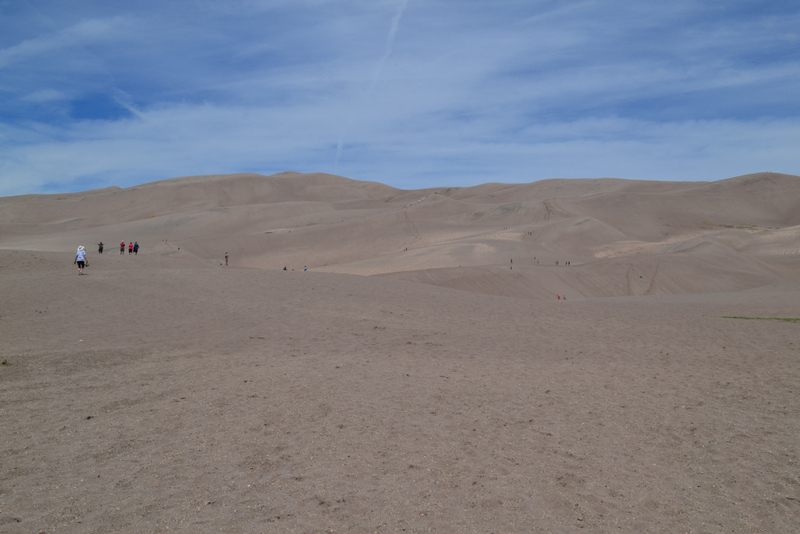 The park boasts seven life zones including the alpine tundra, subalpine, and montane forests of which we experienced on our Humboldt Ascent, as well as wetlands, salt-encrusted plains, grasslands, and of course the famous dunefield. 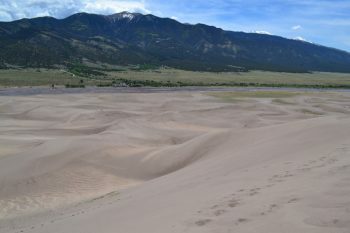 The dunefields comprise approximately 11 percent of a 330 square mile deposit of sand in North America. We were fascinated by the rich landscape and tried to come up with scenarios responsible for the deposition of sand in front of us. A stop by the visitor’s center at the park entrance revealed that the dunes formed over thousands of years in which the predominant southwest winds deposited sands from the mountain streams and lakes of the San Luis valley in a low curve in the Sangre de Cristo range. There are excellent resources available including the national park webpage that provide a more in detail description of the fascinating geology of these dunes. Before we entered the park, we stopped off at this shop called Oasis and rented some sand sleds. 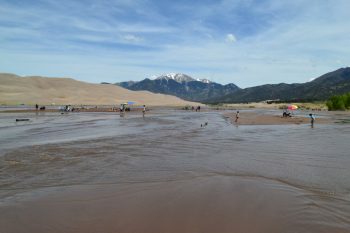 (They are 20 bucks each plus tax for one day) One of the exciting features of the park is the ability to sand surf or sled down the large dunes. With boards and snacks ready, we proceeded to the parking lot by the Medano Creek. The parking lot was almost full around lunchtime on a Monday. We’ve heard holiday weekends and most summer weekends are impossibly crowded but were a little surprised at how many people were there on a weekday. We changed into sandals to wade across the wonderfully cool water to reach the sand dunes. 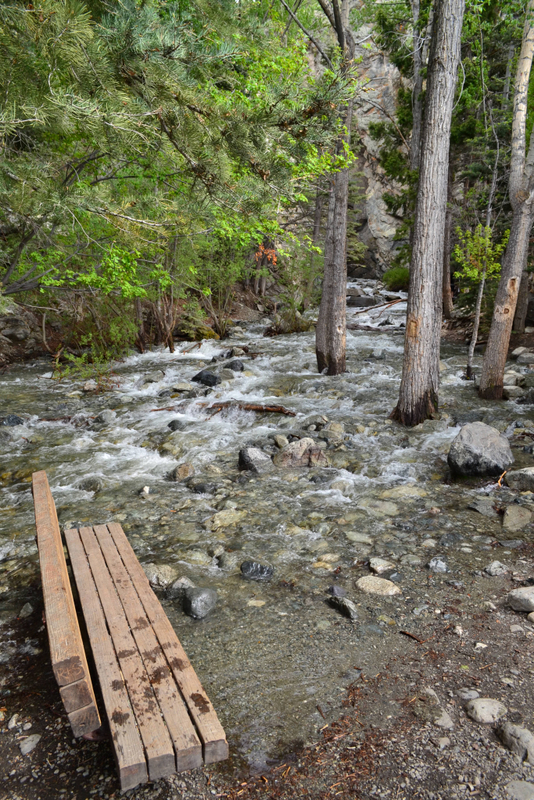 This creek is seasonal, and luckily we arrived at a time when there was some decent water flow. 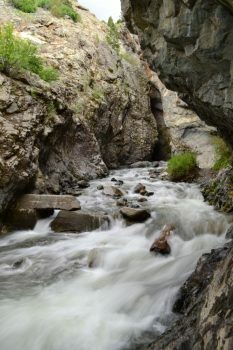 The creek typically flows from April to June, generally peaking the end of May. But, this varies depending on snow melt for the season. After crossing the creek and entering the sand dunes, we realized that perhaps sandals weren’t the best choice of shoes. 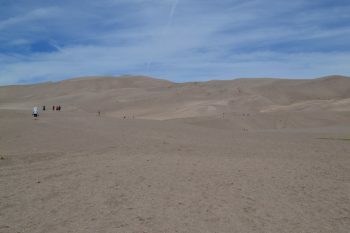 The sand was a bit warm as we reached one of the higher dunes called High Dune which stands 699 feet from base to top. 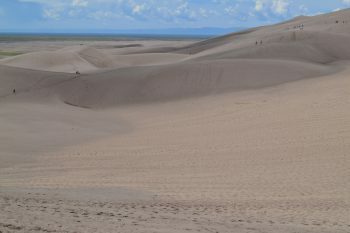 Though not the highest dune in the park, it appears that way from the creek bed and provides complete views of the entire dunefield. It was about 1.5 miles from the parking lot to this high point. 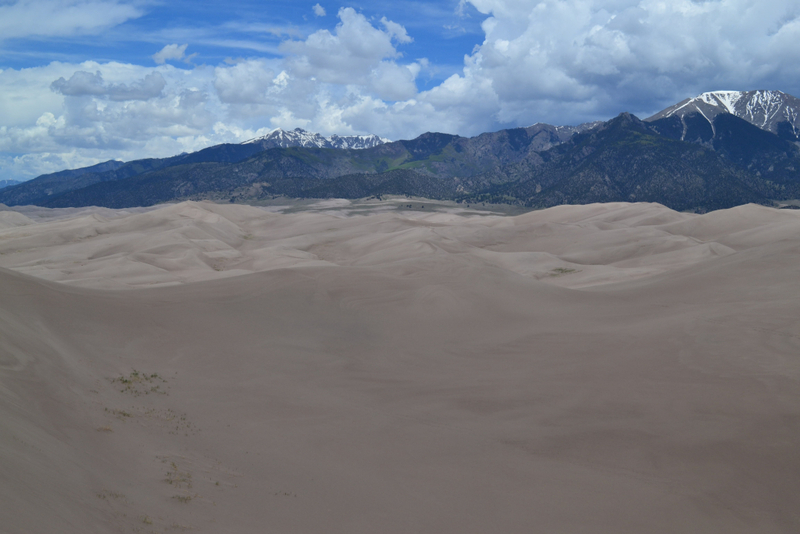 While 700 feet or so doesn’t sound like much compared to climbing over 4,000 feet, it is quite tough in sand. It felt like every two feet forward we fell one foot back. The physical and mental strain of climbing to the dune top was intensified by the mid day sun reflecting off of the sand. 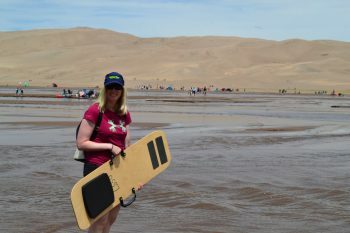 After gaining higher ground in the dunes, we started to play around on our sand sleds. In order to gain decent speed, you must apply a generous amount of wax to the board bottom. We found that with the right grade of incline, sand pack, and wax fast speeds were easy to achieve. Sometimes we also found out that it could be easy to lose control with using our feet as breaks to slow down. This equaled massive amounts of sand in our clothes, hair, eyes, and ears. Make sure to view the video at approximately 3 minutes to see what exactly we mean by this. After a couple of hours of playing in the sand, we opted to head back to the car for a sack lunch and another soak in the Medano. It was wonderfully relaxing. Mid-afternoon we tore ourselves away from this playground to allow time to travel to Zapata Falls. To reach the falls, we left the park and drove about 8 miles before turning left onto the rough 3 mile road to the TH. This was a terribly bumpy, uncomfortable road that seemed to take forever to travel. Once at the top of the road and TH, we were greeted with sweeping views of the entire sand dunes as well as the San Luis Valley. The hike to the falls was really, really short (just under 0.5 miles). However, as we reached the river and the crevasses where the falls are hidden, we realized the water level and flow were still too high to safely reach the waterfall. That being said, a few people did brave the slippery rocks and swift, ice cold water to see the waterfall. We just didn’t feel it was worth the risk. Nonetheless, we still enjoyed the view of the river and rocks and relaxed in the cool breeze from the swift water. 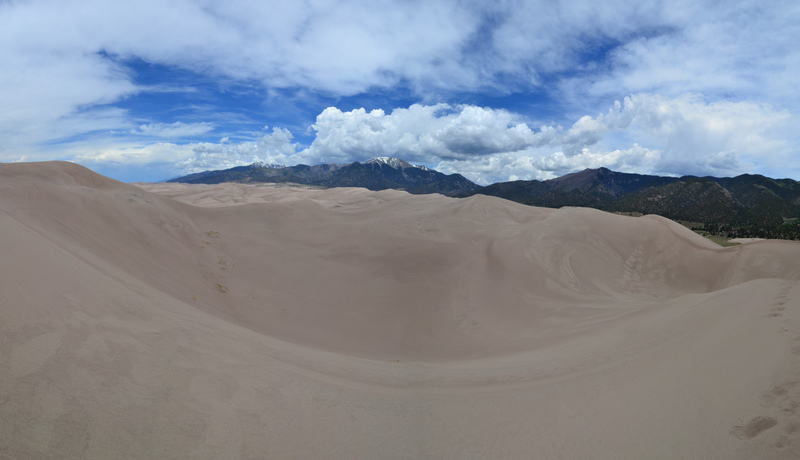 Overall, this was a good first trip to the Great Sand Dunes. We also happened to visit during the year of the Centennial National Parks Celebration. On August 25th, 2016 the national parks service turns 100! So get outside this year and celebrate, and help advocate the preservation of these protected places for generations to come. This is GREAT!!! Love the video (another one bites the dust). Beautiful photos, too. I believe you all went at the perfect time of year. This Nattional Park is definitely on my bucket list! Thanks for an informative and entertaining blog!